Royal Dutch Shell plc (NYSE:RDS-B) made an aggressive acquisition in the middle of an energy downturn. That left investors worried that debt was too high at a company that had a history of poor execution. Oil prices have since recovered from their lows, recently stabilizing above the $50 a barrel range. This has helped Shell's top- and bottom-lines, but obscures some of the more important changes taking place at the integrated energy giant. Here's two key facts you need to know about the last year. Shell's long-term debt ballooned by more than 50% in 2016. Driving this massive uptick in debt was the company's acquisition of BG Group for roughly $50 billion. It was an aggressive move for the company, since energy prices were still relatively weak at that point. While some of the company's peers made opportunistic acquisitions, like ExxonMobil's (NYSE:XOM) $2.5 billion purchase of InterOil, none were on the scale of the BG deal. Investors were justifiably concerned, pushing Shell's shares lower and its yield up to around 10% at one point in early 2016. Clearly aware of the debt issue, Shell announced a post acquisition goal of selling $30 billion worth of non-core assets to fund debt reduction efforts. Over the past year or so, long-term debt has fallen roughly 8% since hitting a peak in the third quarter of 2016, so the company is already making notable headway. It's not done yet, though, and the future looks pretty good from here. That's because Shell has already inked or closed deals worth more than two-thirds of its planned $30 billion target. And with oil prices off their lows, there will be more cash from operations to put toward debt reduction as well. 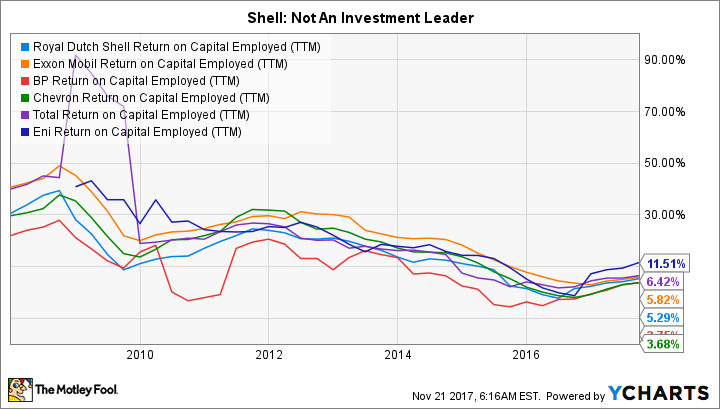 Simply put, Shell appears to have turned the corner on the balance sheet. The other place where a big change has taken place is return on capital employed. Shell has had some high profile misses in recent years, including a disastrous, and now ended, foray into arctic drilling. In fact, it long bumbled along at the low end of the peer group on this metric. Not a great place to be. However, the company's return on capital employed has started to pick up again. That's partly because of the industry upturn, but also because of the reset Shell has undertaken since the BG acquisition. It's basically using the planned asset sales to streamline its business around the operations that it believes have the best future. That, along with internal efforts to trim costs and be more efficient, is helping to boost returns. Shell believes it can more than double its returns over the next year or so, taking them from around 4% in the middle of 2017 to 10%, on average, between 2019 and 2021. More interesting than those numbers is that it believes it can achieve this target with oil prices in the $60 a barrel range. When oil was around $90 a barrel it only managed returns of 8%, so this is a notable change for Shell that, like the debt reduction efforts, is still playing out. The market hasn't been blind to the changes taking shape at Shell. The oil major's stock is up nearly 14% so far this year, more than any other peer (Exxon, for reference, is down around 9%). However, with a yield of around 5.7%, income investors might still find the stock of interest. It's not nearly as cheap as it was, or as some of its peers are today, but it still provides one of the highest yields backed by notable improvement on the debt and execution fronts. In fact, things are so good right now that Shell recently ended its scrip dividend program, which was enacted in 2015 to help preserve cash. If you are a dividend investor, it's definitely worth a closer look as Shell adjusts its business to an evolving energy market.